Description: While out on a walk, Eleanor Trewynn, her niece Megan, and her neighbor Nick spot a young, half-drowned Indian man floating in the water. Delirious and concussed, he utters a cryptic message about his family being trapped in a cave and his mother dying. The young man, unconscious and unable to help, is whisked away to a hospital while a desperate effort is mounted to find the missing family in time. The local police inspector presumes that they are refugees from East Africa, abandoned by the smugglers who brought them in, so while the countryside is being scoured for the family, Eleanor herself descends into a dangerous den of smugglers in a desperate search to find the man responsible while there is still time. Review: This mystery is so cozy it doesn’t even have a murder. Although there are definitely victims, bodies floating in the sea, and a villain, the crime itself is entangled with the British foreign policies of the 1960s or perhaps ’70s – the author herself is unclear on her dates. The entire root for the crime is an immigration issue. When the British Empire began to crumble in the ’60s, many African states, previously under the British rule, declared independence. British citizens were expelled. The white Brits returned to England. Unfortunately, many East Indians also worked for the British in Africa and held British passports. They were expelled too, of course, but the British government denied them the rights to settle in England. Those people had nowhere else to go. No other country, India included, would grant them citizenship. With British passports but no entry visas, many of them had no choice but vagrancy. Others opted for some illegal ways into the country. And of course, where the law is so inhuman it has to be broken, a number of greedy felons enter the fray. Human smuggling, money, and racism intertwine in unholy combinations, creating the background for this story. Most of the characters investigating the crime are familiar to the readers from the previous novels of the series. Our old acquaintances include Eleanor, an absent-minded, retired lady who forgets to lock her doors but always remembers people and faces, and her niece Megan, a sergeant with the Cornish Police. There is also Megan’s boss, the grumpy DI Scumble, and Eleanor’s assorted friends and neighbors. Together, they solve the crime perpetrated before the novel started, but I won’t relay the details here to avoid spoilers. I would also point out that it’s not necessary to read the other novels of the series to appreciate this one; it stands firmly on its own. The action is rather lagging, despite the urgency of the victims’ situation. Too many unnecessary chats, tea cups, and other trifling aspects are woven into the tale like red herrings, so the readers always wonder, together with the heroes: is this man important? Will this woman play a role later in the story? Some of those hints even pay off eventually, while others peter to nothing. On the whole – an easy, entertaining read, although nothing special. Description: Spring hemlines for 1924 have risen almost to the knee, to the dismay of Daisy’s mama-in-law. Fashion is hardly the only bone of contention between Daisy and Mrs. Fletcher, but Daisy has encountered a problem that eclipses her domestic dilemmas. 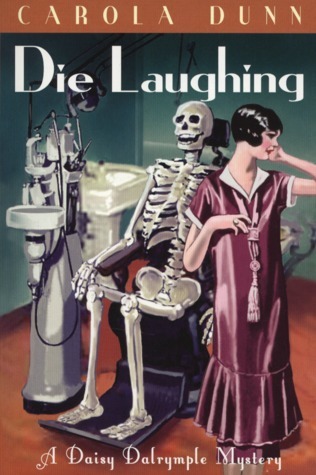 A visit to the one person sure to instill terror into Daisy’s dauntless heart–the local dentist–turns out even worse than expected when she discovers Raymond Talmadge slumped dead in his chair, a nitrous oxide mask clamped to his smiling face. Others may believe the dentist was a secret dope fiend whose addiction took a tragic turn, but Daisy and her husband, Chief Inspector Alec Fletcher, are sure he was murdered. Suspects abound–the devastatingly handsome Talmadge didn’t need laughing gas to make his female patients swoon. And then there’s Talmadge’s wife, Daphne, who was involved in an illicit dalliance of her own. With scandals surfacing in a case that grows more tangled every day, Daisy faces her most perplexing mystery yet, courtesy of a cold-hearted killer who may be preparing to strike again. As always, Daisy stumbles upon a dead body in the beginning of the book. And not just a body – it’s her dentist. The investigation, conducted mostly by Alec, the DCI of Scotland Yard and Daisy’s husband, proceeds in a normal way, but now and again, Daisy comes up with a new little factoid or a new insight, and they frequently turn Alec and his crew in a new direction. I can’t comment on the characterization in this book alone. I absorb Daisy as a whole, like a living person. With every encounter – every book in the series – she grows more complex and more human, progressing from a literary mystery heroine to a woman who lives nearby. I love her. For me, she is a friend, insatiably curious, wise, and deeply compassionate, always ready to take those less fortunate under her wing. Her resentment-laced relationship with her mother-in-law makes her even more alive. The secondary characters are well defined as well, some of them recurring, others entirely new. Together, they form a solid framework for the story – the only story in the entire series where the culprit has got away from justice. But the search for the murderer is a fun ride, fast and baffling. Every chapter, one more red herring is disposed of, and a new suspect appears. The author’s subtle humor, present in the whole series, comes to the fore in this book. After all, how many dentists get murdered in mystery fiction? This is the only one I know. As Daisy gave her address, she was trying to decide what to do next. The sergeant obviously wasn’t going to listen to her. Should she phone the Yard again, or just give up and let some maniac run loose hither and yon murdering dentists? The notion was undeniably attractive. She resists the attraction manfully and goes on helping the investigative team in any way she can, even using her “adhesive loquacity” (what a phrase!) when needed. Note: Look at the gorgeous cover of this paperback. I read the hardcover edition with a different cover art, also good, but this one with a skeleton is just fantastic! Description: In December 1923, the formidable Dowager Viscountess Dalrymple has decided that for Christmas the family will all gather at Brockdene in Cornwall at the invitation of Lord Westmoor. Her daughter – Daisy Dalrymple Fletcher – is something less than pleased but yields to the demands of her mother, especially as she’ll be there just before the holidays working on another article for Town and Country about the estate itself. But the family gathering quickly goes awry. Brockdene, it seems, is only occupied by the Norvilles – poor relations of Lord Westmoor – and Westmoor himself won’t be joining them. So Daisy, her husband Detective Chief Inspector Alec Fletcher of Scotland Yard, and their family must spend their Christmas holiday trapped in an ancestral estate with a rich history of lore, ghost stories, rumors of hidden treasure and secret passageways with a family seething with resentments, grudges and a faintly scandalous history. The veneer of civility that pervades the halls of Brockdene, however, begins to wear thin when long-held family secrets threaten to bubble over, and one of the Christmas guests if found savagely murdered. With few clues as to who committed the murder and with too many motives as to why, it is once again up to Daisy to sort out the truth that lies beneath a generation of poisonous secrets. Review: This cozy English mystery is a ‘pure’ Daisy Dalrymple, cute and predictable (in a good way), one of the best in the series. The action takes place over Christmas in a crumbling mansion of an earl. He is Daisy’s distant relative and he invited Daisy (or rather her mother needled the invitation out of him) and her family for the holidays, but for Daisy, it is also a working vacation – she has an assignment to write an article about the mansion and its centuries-old history. In accordance with the tradition of this series, the first few chapters describe the life of the mansion, familiarizing Daisy as well as the readers with the place’s shabby, decaying splendor, the quirky set of its denizens, and their convoluted family dynamics. Then a tragedy interrupts the jolly festivities, or should I say their pale approximations – one of the guests gets murdered. Contrary to most other novels of the series, Daisy doesn’t discover the body. Her husband Alec, Detective Chief Inspector of Scotland Yard, does, so he has to interrupt his own vacation for a spot of detection, but Daisy definitely helps her beloved. For most of the tale, the readers are as baffled as the police about who the culprit of this drama is, although it’s largely a process of elimination. When we disregard all those who can’t be murderers, the only person left on the list of suspects is the guilty party, however unlikely. 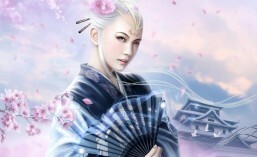 The characters are divided into two clans. The series newcomers, the members of the family under suspicion, all have their distinct personalities. Some are depicted deeper than others, but on the whole, the group is believable. Like in any family, there are various currents swirling among them: affection and dissatisfaction, vulnerability and stupidity, shame, envy, and passion. The recurring stars – Daisy, Alec, and his team of detectives – make this book a welcome addition to the series. Everyone has his or her accustomed role to play, a slot to fill, to the readers’ continuous delight. The children – Daisy’s stepdaughter Belinda, her friend, and her puppy – provide some humorous interludes. Etiolated – pale and limp, feeble looking, effete. Nice to know. Canard – 1) a malicious rumor; 2) something to do with airplanes. Recommended for all the fans of the series as well as the lovers of cozy mysteries. Description: In late 1923, the newly married Daisy Dalrymple and her husband Detective Chief Inspector Alec Fletcher of Scotland Yard, come to America for a honeymoon visit. In the midst of a pleasure trip, however, both work in a bit of business – Alec travels to Washington, D. C. to consult with the U.S. government, Daisy to New York to meet with her American magazine editor. While in New York, Daisy stays at the famed Chelsea Hotel, which is not only close to the Flatiron Building offices of Abroad magazine, where she’ll be meeting with her editor, but home to many of New York’s artists and writers. After her late morning meeting, Daisy agrees to accompany her editor, Mr. Thorwald, to lunch but as they are leaving the offices, they hear a gun shot and see a man plummeting down an elevator shaft. The man killed was one of her fellow residents at the Chelsea Hotel, Otis Carmody, who was a journalist with no end of enemies – personal and professional – who would delight in his death. 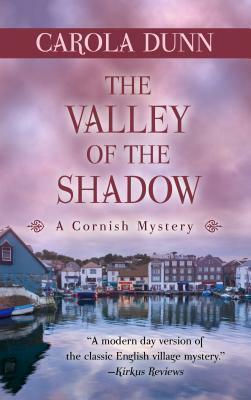 Again in the midst of a murder investigation, Daisy’s search for the killer takes her to all levels of society, and even a mad dash across the country itself, as she attempts to solve a puzzle that would baffle even Philo Vance himself. I didn’t like this book as well as most of the others in the Daisy Dalrymple series. The story deviates from the usual plotline of the series, both in structure and in characters, and the differences are glaring. First, the action takes place in America, not in Britain, and I commiserated with Daisy, as she struggles to understand the land and its people, as well as translate the frequently unfamiliar vernacular. She wondered why Americans insisted that they spoke English, when they might just as well call their language American. The oddest thing was that people kept telling her, an English woman speaking the King’s English, that she had a quaint accent! Second, all the characters except Daisy and her husband, Alec Fletcher, are Americans, of course, and not nearly as charming as most of the British characters of Dunn’s other novels of the series. The characters are also not well defined, and there are unnecessarily many of them, making the narrative confusing at times. Even Daisy and Alec are kind-of blurry, although my familiarity with them from the other novels served to alleviate this shortcoming. The tale is extremely slow in the first half, while Alec is off the spotlight and Daisy sleuths alone, but as soon as he arrives on the scene, the story builds speed and momentum, exploding in an airplane chase across America: from New York to Eugine, Oregon. Remember – it’s 1923, and planes are still made of sticks and cellophane, so the entire sequence is highly educational and fun to read. But the denouement is disappointing. Despite the flaws I mentioned, I enjoyed meeting Daisy again. By now, I’ve almost exhausted my secret cache of unread Daisy Dalrymple mysteries – only a couple left – and it makes me sad. Daisy is an old friend, even though this time, her story is not as fascinating and sometimes it even feels contrived, artificial. To sweeten the deal, this novel, like most Dunn’s novels, contained a couple new words for me, the words requiring a dictionary. The first word is on the cover – Muckraker. When I first picked up this book, I thought it was some kind of a bird or a toy. In all my reading, I’d never encountered this word before. Now, upon consulting a dictionary, I know that it means an exposer or a gossipmonger, someone who digs up dirt. Or an investigative journalist. The second word new to me was Inapposite, which means irrelevant. Many of the readers might already be familiar with that word, but I wasn’t. The best feature of this book was Daisy’s puzzled contemplations on the differences between the two cultures and two tongues, even though both tongues are still called by the same name: English. 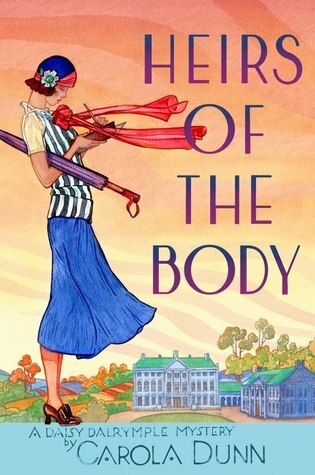 Description: This lively mystery debut introduces the Honorable Daisy Dalrymple, who has taken a job to ensure her independence – an unusual step for the daughter of a viscount in 1922. 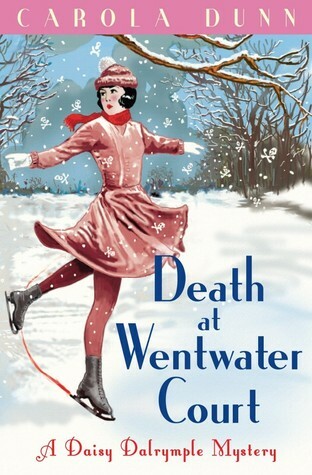 Her first assignment for Town and Country takes her to Wentwater Court at Christmastime to write about the Wentwater family. Her visit is disrupted by unwelcome guest and -according to Lady Josephine – “utter cad” Lord Stephen Astwick. When Astwick’s body is found floating under the ice in the estate’s lake, attractive Scotland Yard Chief Inspector Alec Fletcher arrives on the scene. Daisy’s photos of the victim, showing ax marks in the ice, suggest the death is murder and prompt Fletcher to enlist her as his stenographer during his investigations. With the entire family, from the earl to his grandchildren, under suspicion, Daisy takes on the role of liaison between landed and working classes. Astwick’s indiscretions come to light and disclose more motives for murder at Wentwater Court. Review: Reading this book was pure, unmitigated pleasure. Although it is the first novel of the series, it’s not the first Daisy Dalrymple mystery I’ve read. I have already read several others in no particular order and I have to admit: I enjoyed them all. 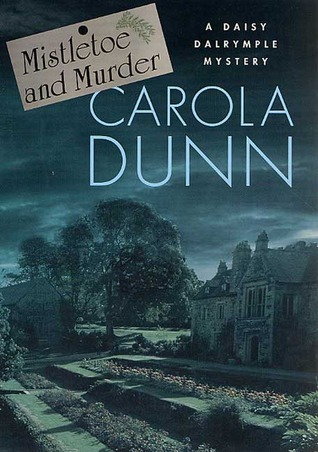 I love the lead characters, I love the setting – England in the 1920s – and I absolutely adore Carola Dunn’s easy and expressive writing style. Especially her sweet British vocabulary, which makes the experience of reading her novels so delightful. I’ll definitely use tommyrot somewhere in my own writing; the word sounds and feels funny. This novel is a fair representative of one of my favorite genres: a cozy English mystery. The writer does a good job of introducing the protagonists of the series: a budding journalist Daisy Dalrymple and the Chief Inspector of Scotland Yard Alec Fletcher. At the outset, Daisy arrives at a country estate of an earl to write an article about his beautiful centuries-old mansion. The lives of the inhabitants of the mansion might look untroubled on the surface, but the currents of tension run underneath their illusionary complacency. A couple days later, one of the guests at the mansion gets murdered. Reluctantly, the earl calls the police to investigate, and Alec Fletcher arrives on the scene. Together, Alec and Daisy find the murderer, and the beginning of their tentative romance made me feel happy for them both. Although she is an Honorable, a daughter of a peer, and he is a middle-class copper, the social chasm between them doesn’t seem as deep as it would’ve been before the WWI. The author’s depiction of the years between the wars, the years of profound change in England, might not be very deep, but it is lighthearted, tasteful, and true. 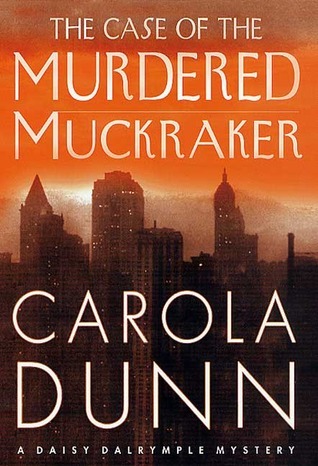 Dunn pays much more attention to details and the psychology of the murder than to physical action, so the plot moves slowly, but every minute counts. We also get to meet a score of wacky secondary characters (some reviewers say too many too soon), and each of them adds flavor to the story and complications to the investigation. As in every enclosed mystery, the number of suspects is limited, the motivations tangled, and the timeline deceiving. And although I could guess the identity of the murderer a bit before Daisy and Alec, it didn’t detract from the attraction of the story. My favorite quote: “The Hampshire countryside surrounding the station was hidden by a blanket of snow, sparkling in the sun. Frost glittered on skeletal trees and hedges. The only signs of life were the train, now gathering speed, the uniformed man carrying her stuff across the line behind it, and a crow huddled on the station picket fence.” Simple and elegant.